I'm excited to announce my new guest blogger series! I had the amazing opportunity to guest post from some bloggers when I was first starting out and it was instrumental in my career and learning the ins and outs of blogging, as well as gave me the chance to be introduced to a new audience. Many of you may have even starting following me from one of my guest posts! I reached out to some up-and-coming bloggers that I thought all of you would love, and have asked them to come onto Against all Grain as regular guests to share their creations with you. These are exclusive to my site, but I really encourage you to visit their blogs and Facebook pages if you like what you see here for more recipes! First up, I'd like to introduce you to Ali from Inspiralized.com. You all probably already know about my love for the spiral slicer, but Ali takes it way past zucchini and cucumber and shows you how to make creative ‘noodle' dishes out of a variety of vegetables and keep your dinners exciting. If you don't have a spirilizer, get one HERE now!!! Welcome Ali everyone! Living a healthy, grain-free life doesn't have to mean sacrificing classic favorites, such as noodles and pasta. 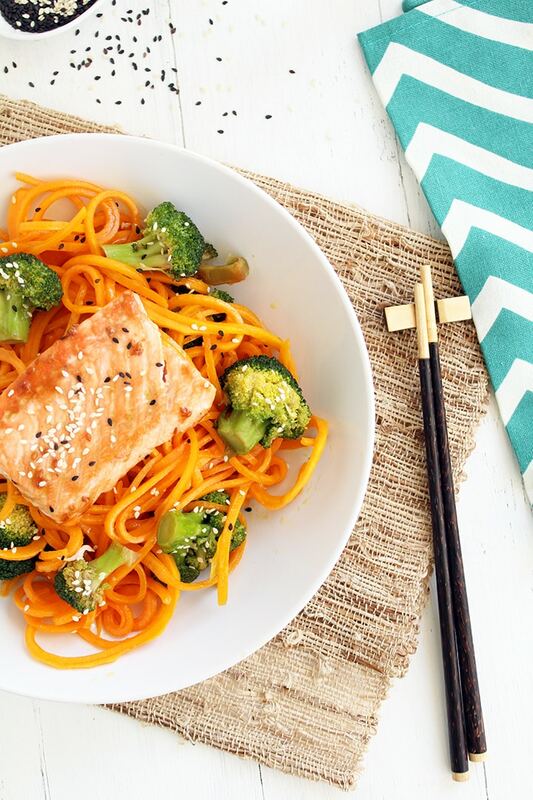 With the spiralizer, the kitchen countertop tool that turns vegetables into noodles, you can create filling and delicious dishes that taste just like the real thing! Zucchinis are the most popular vegetable that is spiralized, allowing us to create fresh noodles in merely seconds. However, during the winter time, zucchinis are out of season and dwindle in size in the supermarkets. It's tough to feed hungry mouths when it takes a few zucchinis to make a full bowl of noodles! That's where butternut squash comes in. Butternut squashes take slightly more prep time to spiralize, but offer a whole new flavor, color and texture. These spiralized veggie noodles are thicker, stronger and don't release as much water as the zucchinis do. Therefore, they can be used with a thinner sauce without the worry of a soupy bowl of noodles. This winter, experiment with different veggies – carrots, butternut squash and beets. All of these seasonal vegetables carry different nutritional benefits and flavors, but they all taste just like real pasta and noodles once paired with the right sauces and dressings! Ali Maffucci is the blogger and founder at Inspiralized.com, the first and only online resource dedicated to the spiralizer. Follow Inspiralized on Twitter, Instagram, Facebook, Pinterest and go to her Vimeo page for spiralizing video tutorials. 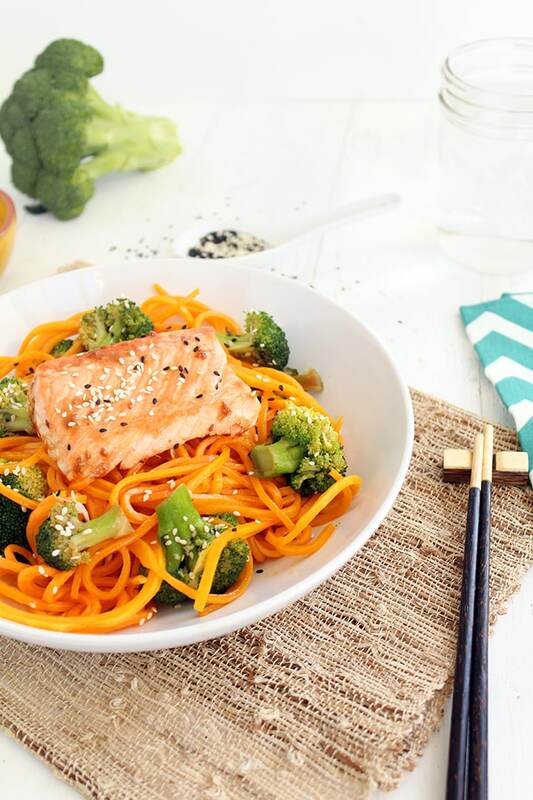 While she doesn't live a completely grain-free or Paleo lifestyle, she understands and appreciates that spiralizing is a wonderful and accommodating option for those who do. She currently resides in Jersey City, NJ. Place a large saucepan half-way filled with water over high heat to bring to a boil. Once boiled, add in the broccoli, cover and cook until easily forked. When done, drain into a colander and set aside. While water is boiling, prepare your salmon. Place the salmon filets in a gallon ziplock bag with the marinade ingredients and refrigerate for 5-10 minutes. 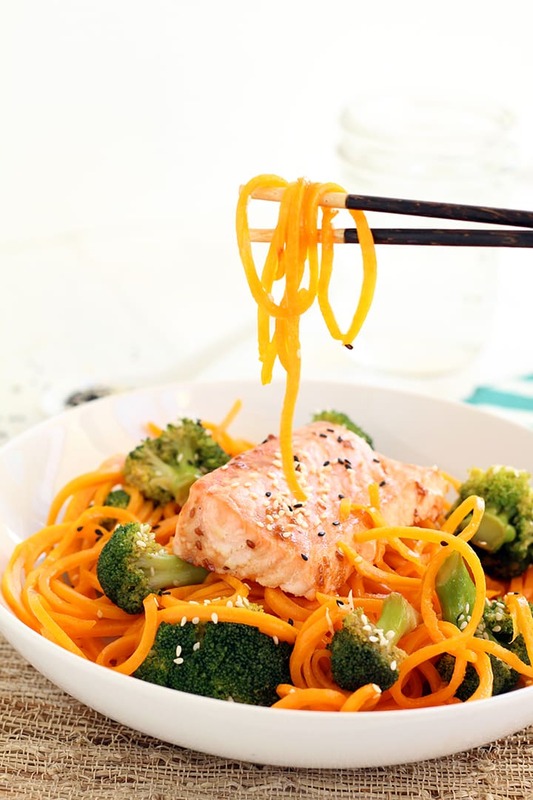 While the salmon marinades, use a spiralizer to spiralize both of your butternut squashes. First, slice off the bottoms, which are the most bulbous parts of the squash. Using the remainder of the squash, slice off its other end. Peel the squashes completely. Then, chop each in half. Load each half of the squash into the spiralizer and spiralize each one, using the blade with the smallest triangles. Remove the salmon filets from the marinade and place onto a baking tray. Bake for 15 minutes. Place a large saucepan over medium heat and add in the coconut oil. Once the oil heats, add in the garlic and ginger and cook for 30 seconds. Then, add in the fish sauce, honey, coconut aminos and sesame oil. If you like a thicker sauce, then add in the arrowroot powder and whisk all together to form a paste. Next, add the broccoli, sesame seeds and butternut squash noodles. Toss to combine.